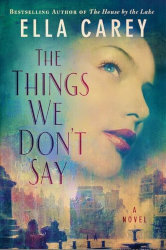 THE THINGS WE DON’T SAY was released by Lake Union Publishing through Amazon First Reads program on June 1, 2018. We’ve secured rights deals for Ella Carey’s titles in 7 languages, including Czech, German, Italian, Portuguese, Slovakian, Slovenian, an Australian English-language edition, and a large print edition. Whenever I’m in a reading slump, I reach for historical fiction. I love reading about the past and the people who shaped the world we live in today. No matter if the underlying plot is mystery, romance, or saga, I’m swept away by the story all while learning. Two birds, one stone! This is what I adored about The Things We Don’t Say. In a novel loosely based on the renowned English artists’ circle Bloomsbury group, Ella Carey masterfully moves between generations to tell a riveting tale of a historical movement through the eyes of two women fiercely determined to hold on to their ideals. Before I read the book I had a somewhat fuzzy, glorified picture of the Bloomsbury group. I knew they were considered bohemians and I knew that many groundbreaking artists and writers came out of the movement, but I didn’t know much more than that. In Carey’s deft hands, I was not just absorbed in the characters’ loves and losses; I was completely transported to the rich and heady atmosphere of the salons of London and France in the 1910s and ’20s. Had Carey not written this sumptuous novel, I would have never known that much of the freedom of expression I so value today is thanks to forward-thinking women like those in The Things We Don’t Say. Ella Carey is the international bestselling author of The House by the Lake, From a Paris Balcony, and Paris Time Capsule. A Francophile who has long been fascinated by secret histories set in Europe’s entrancing past, Ella has degrees in music, nineteenth-century women’s fiction, and modern European history. She lives in Australia with her two children and two Italian greyhounds.